Ready for the trails? Check out this Breezer Repack Team review first. I’ve ridden bikes since I was a kid, and graduated from discount store Schwinns to high-priced mountain bikes in my twenties. I’ve learned the hard way that what your friends like – or what’s hot in the bike shops, might not be the best bike for me. My friends kid me about it, but I do a lot of comparing and contrasting before buying a bike. I guess I’m picky and you should be too. In this Breezer Repack Team review, I’ll give you lots of information about the 2017 model of this full suspension bike and suggest a few alternatives. Hopefully my research will save you some time when you shop for a new bike. If you’re in a hurry and just want to see the best price for the Breezer, we got you covered! Click here to see the best price for Breezer’s Repack Team MTB. 1.2 What Is The Breezer Repack Team 2017? A full suspension mountain bike has a front suspension fork and a seat post or crossbar for rear suspension. The extra suspension cushions the blow when riding bumpy trails. 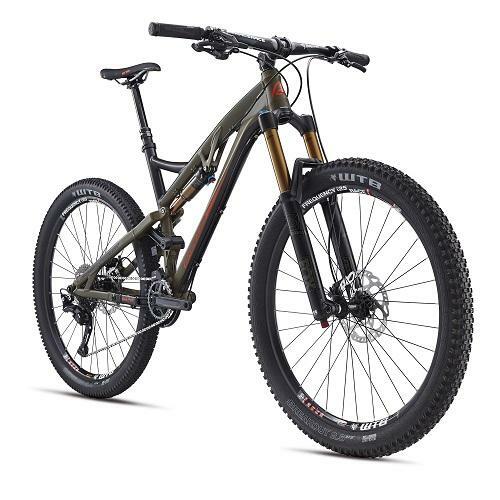 Full suspension mountain bikes are pricier than hardtail bikes. Hardtails have one solid piece with no suspension. You can ride a hardtail or full suspension bike on trails, but the hardtail ride will be bumpier. A full suspension bike weighs more because of the additional rear shocks, tubes and pivots. A hardtail has fewer parts, so there’s less to break down and repair. Full suspension bikes give you a safer, more comfortable ride. You’ll feel more lumps and bumps with a hardtail. Hardtails are generally cheaper than full suspension bikes. The rear shock and pivoting rear end on full suspension bikes account for most of the price hike. Choose a hardtail (one-piece frame) bike if you rarely bike on natural trials or in the mountains. It will save you money over a full-suspension bike and still give you all the features you need. What Is The Breezer Repack Team 2017? An all-mountain bike with Breezer’s MLink suspension design, the Breezer Repack Team 2017 has 27.5 inch wheels and a trail-ready 160mm of travel. The Breezer Repack is one of the mountain bikes developed by Breezer Bikers, the company founded by mountain bike pioneer Joe Breeze. A fellow mountain biker knows exactly what features will benefit you on the trail, so you can have faith that Breezer bikes will work as well in practice as they do in the design stage. The Breezer Repack is made for long trail biking. If you like to spend days exploring trails by your house or even in national parks), the Breezer Repack may work for you. An easy-to-maintain full suspension bike, the Repack has a sleek, simple look, like a hardtail, but gives you lots of features. The angled mid-range wheels roll over rocks, twigs and other obstructions easier than smaller wheels. The wheels also give you a lower center of gravity so you’ll feel more comfortable in your seat. The lightweight aluminum frame from D’Fusion lets you maneuver corners (and uphill trails) better. A BB92 bottom bracket streamlines your ride, and the Fox 36 Float fork provides the 160mm of travel to get you on your way faster. Made to excel on natural terrain with bumps and light obstacles, the Breezer Repack Team 2017 has a Shimano XT 11-speed drivetrain and an 11.42 cassette. This configuration outs enough tension on the chains to handle tough ascents and descents. When compared with the Breezer Supercell Team 29r, the Repack Team 2017 holds its own. The Supercell has a Shimano Deore XT drivetrain 2×11 and the Breezer Repack Team has a Shimano Deore XT drivetrain 1×11. Most riders I know prefer the lighter, simpler 1×11 drivetrain. Most riders find the bikes pretty similar. They both climb well and handle rough terrain. The main difference? The Supercell has 29 inch wheel size instead of the Repack Team’s 27.5 inches, giving you more traction for braking or cornering. The Repack Team’s not too shabby in that regard, either, even though it has smaller wheels. With the Breezer Repack you’ll be ready for anything. The unique MLink suspension on the Breezer Repack Team makes riding more comfortable even when you’re hitting hard corners and turns. With longer links than the average mountain bike, the MLink design handles both pedaling and braking for a smoother ride. Breezer Repack Team has excellent traction partially because of its WTB Breakout tires. Designed for speed and better grip on the trail, these TCS (tubeless compatible system) tires work great on dry, rock singletrack terrain and over slightly wet ground. The Breezer Repack gears give you all the choices you need for speedy downhills or careful ascends. It has an X11SL 11-speed chain and a Shimano Deore XT-11 speed, 11-42 cassette with Shimano Deore XT-11 speed shifters to help you change up when needed. The Breezer Repack Team has a D’Fusion hydroformed 6066 frame with a tapered head tube, sealed cartridge bearing pivots and D’Fusion Asymmetrical chainstays. When paired with the MLink system, these features help make the frame stiffer and reduce wear on the bearings. The bike is considered a little heavy for a mountain bike at 32.8 pounds, but it is easy to maneuver if you have some experience on technical trails. The Breezer Repack Team will suit most of your needs for uphill climbing. It completes climbs pretty quickly and won’t get stuck on rocks or twigs. Any technical trails are a breeze for this bike. Climbs well over rocks, twigs and roots. The Repack Team is easy to manage if you’re used to longer mountain bikes. Launched in 2014, it’s been fine-tuned in the past few years to make riding even smoother. The 27.5 inch mid-range wheels gives you nimble rides on the descent and helps you bash through obstacles with no hesitation. The Race i25 TCs 27.5 tubeless ready rims will help you make the most of every ride. The RockShox Reverb Dropper Seat Post is adjustable, and lasts through rain, snow, sand, dirt and any kind of terrain or abuse you throw at it. The RockShox Seat Post offers fast action and looks good. Shimano’s drivetrain has a chainring tooth profile that competes just fine with the better-known SRAM drivetrains. It offers excellent shifting, and is just as durable as a SRAM. The Breezer Repack Team has Shimano Deore XT hydraulic brakes to save time and give you a quick, fluid stop. Hydraulic disc brakes use reservoirs and hoses with special fluid to help operate the brakes. Since the brake system is closed, dirt, water and debris can’t clog it. Breezer hired some of the best kinematics engineers to develop a new full suspension system for mountain bikes. MLink, short for MidLink, uses long links in a dual link layout. The back pivot is placed in the middle of the chainstay. Breezer says the MLink design reduces pivot stress and makes the layout less binding. With a Kashima coat to make heads turn and 160mm of travel, the Fox 36 Float Fork, lets you tune the fork to any trail you ride, and the Fox rear shock has the same Kashima finish. The aluminum Repack frame has heavy shaping, tanks to the hydroformed tubes, and it’s tough enough to survive knocks, pings, trail debris and even drops. The brake caliper post mount is serious enough to double on a dirt bike. The Breezer Repack Team comes in several sizes, like other high-end mountain bikes. Small (17 inches), Medium (18.5 inches), Large (19.5 inches) and Extra Large (21 inches). To test a bike for proper sizing, make sure the bar that goes between the handlebar and seat, or the top tube, leaves a space of two or three fingers below or your pants inseam (groin) when you straddle the bike with your feet flat on the floor. Bike manufacturers may have slightly different sizing, so a small in Breezer bikes may be a medium in another brand. Always check online sizing charts for the bike that interests you – better yet, talk to a sales associate at your local bike shop and check out the bike in person. 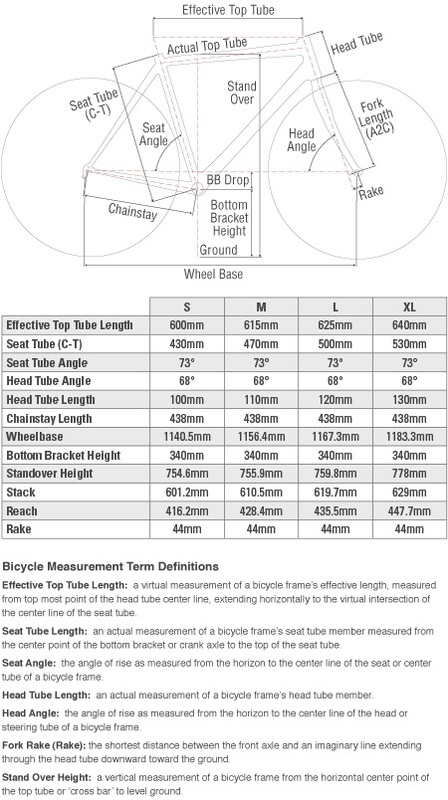 Check the measurements of the bike components, including the wheelbase, bottom bracket height, standover height, head tube angle and seat tube, to make sure the bike will be a good for you. Some parts, like the rake and seat tube angle, are the same in a small bike and an extra-large, while others, like the stack or wheelbase change in increments of 10mm or more between sizes. The Breezer Repack Team 2017 retails at $4689. It may be a bit pricy for novice mountain bikers, but if you ride bumpy terrain often, it’s certainly worth the extra cash. Check out these mountain bikes if the Breezer Repack Team is too expensive for you, or doesn’t have enough of the features you need. Breezer Repack Expert 27.5 2017: The Breezer Repack Expert 27.5 has the same mid-range wheel size as the Repack Team and 160mm of MLink suspension, too. Instead of a 1 x11 drivetrain like the Repack team, it has a Shimano Deore/SLX 2×10 drivetrain. The WTB Speed i25 tubeless rims reduce your chances of getting a flat. They’re outfitted with WTB Breakout tires like the repack Team, but the gears include a Shimano HG-50 10 Speed 11-36T cassette and KMC X10 10-speed chain. At $3149, it has the lowest suggested retail price of all the alternatives. Click or tap here to learn more about the Breezer Repack Expert 27.5 2017. Diamondback Catch 2 27.5: The Diamondback Catch 2 27.5 has the same wheels and offers the same comfortable ride as the Repack Team. Instead of MLink, it has Diamondback’s Level Link suspension for a smooth ride. It has SRAM hydraulic disc brakes instead of Shimano. With a suggested retail price of $3999, with deep discounts available online, it’s not cheap, but you’ll save at least a few hundred bucks over the Breezer Repack Team. Click or tap here to learn more about the Diamondback Catch 2 27.5. 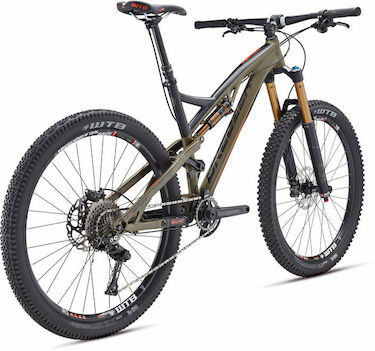 Fuji Auric 1.3 27.5 2016: Fuji’s line of Auric full suspension mountain bikes share the same MLink system with Repack Team. It comes with a Fox 36 Float Front fork to give you 160mm of travel, and it mixes SRAM and Shimano components for better responses on the trail. The frame is made of light but durable Fuji A6-SL custom-butted alloy steel and the Schwalbe Nobby Nic tires are strong enough for the harshest trails. The Fuji Auric 1.3 at $4549, so it’s just about as expensive as the Repack Team. Click or tap here to learn more about the Fuji Auric 1.3 27.5 2016. The Breezer Repack Team mountain bike gives discriminating riders one of the best full-suspension systems in a smart-looking and durable frame. Seasoned trail hounds and weekend warriors who aspire to join them should look into this bike. Be forewarned, though, the Breezer Repack Team will put a dent in your bank account. The unique MLink suspension reduces tension on the frame and rider when you encounter obstacles on the trail. The 27.5” mid-range wheels give you fast descents and help you maneuver over rough terrain. The durable aluminum frame looks great and can take any abuse the weather or your trail riding can throw at it. 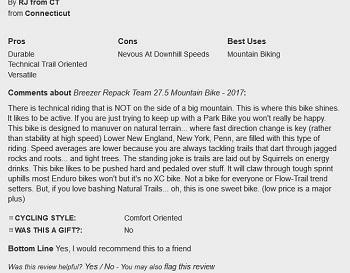 I hope this Breezer Repack Team review has given you enough information about this bike to make an educated buying decision. Click the link below to see the Breezer for yourself.